When it comes to improving your appearance, and capturing a more youthful look, blepharoplasty is perhaps the best bang for your buck of any cosmetic procedure at The Esthetics Center. Of all the services that we offer, it is also the most common. As we age, skin loses its elasticity. This, combined with the constant pull of gravity on our bodies, can often result in excess skin collecting on the upper and lower eyelids. In addition to excess skin, our faces are prone to fat bulging from behind our eyelids, as the thin membranes that hold the fat weaken with age. The best way to counteract these effects of aging eyelids is with blepharoplasty. Blepharoplasty is a surgical procedure which will reduce the bagginess from the lower eyelids as well as the excess skin from the upper eyelids. This is done by removing extra skin, muscle and fat from the eyelid area, which will minimize bags around the eyes. This will lead to a much younger appearance— typically, our patients look a decade younger after a blepharoplasty. This surgery is done for both cosmetic and functional reasons, as not only does it result in a younger look, but it also is an effective way to improve the vision of older patients whose sagging eyelids may be blocking part of their line of sight. WHO IS A BLEPHAROPLASTY CANDIDATE? A blepharoplasty candidate is someone who either currently has droopy eyelids, or expects to have droopy eyelids due to family genetics. If you are currently having difficulty seeing because your eyelids are impeding your vision, you are an obvious fit for this procedure, but you may also be a great candidate if you are not seeing dramatic drooping yet, but one or both of your parents have/had severe bagginess around their eyelids. Most of our blepharoplasty patients are over the age of 35 and are in good health. Additionally, they are non-smokers or are willing to quit smoking before and after their blepharoplasty surgery. 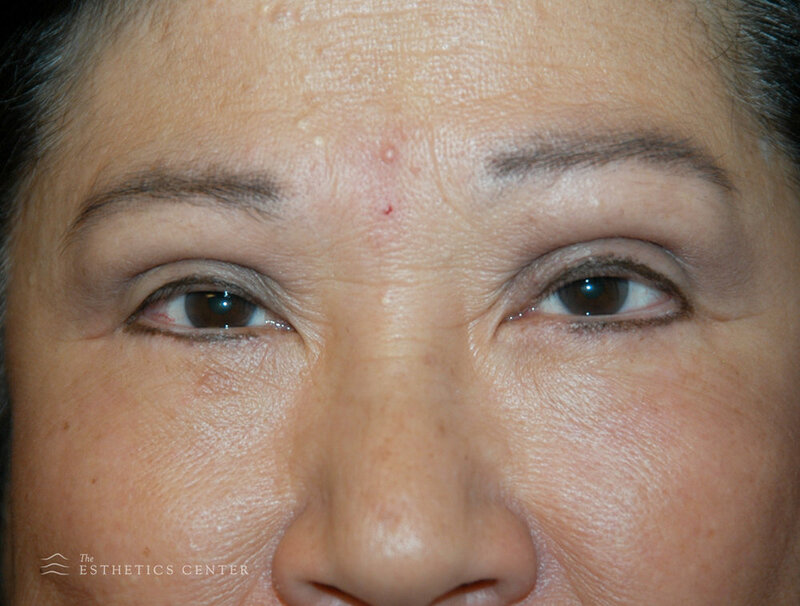 Blepharoplasty is done using twilight sedation and local anesthesia. It is commonly, and easily, combined with other procedures as it is short with a relatively easy recovery. Blepharoplasty surgery typically takes between one to two hours depending upon whether upper, lower, or both are done. The first phase of the surgery is the surgical plan. The incisions are carefully and precisely drawn on the patients eyelids, then checked for adequacy and symmetry. The upper eyelid incision is hidden in the path of the upper eyelid's natural crease. If necessary due to excess skin, the incision is extended into the creases at the side of the eye. Once the incision is made, the excess skin is removed, muscles may be tightened, and fat-related fullness or bags are repositioned or removed, depending on the patient's individual needs. For the lower eyelids, an "incisionless" approach is preferred where the incision is made on the inside of the lower eyelid where it cannot be seen. This is known as a transconjuctival incision. Using this method on the lower eyelid, the fat that is the cause of the fullness or bags, is removed and repositioned where it is most beneficial to the patient's appearance. Often this is all that is necessary, and the procedure is complete without any sutures being placed. However, if after contouring of the lid fullness, excess skin is noted, a tiny "pinch" of skin can be taken just below the lashes to further smooth the lid. A very fine row of silk sutures are placed to finish the procedure. 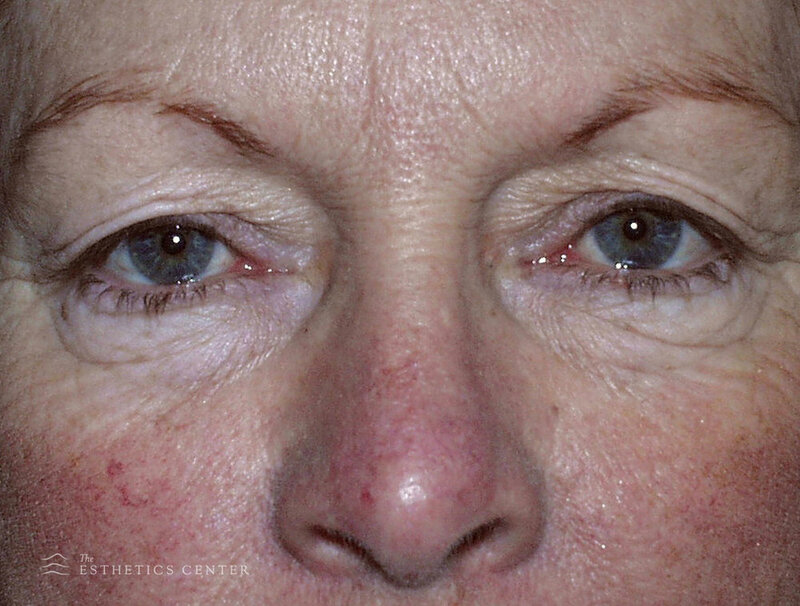 The recovery period for blepharoplasty typically includes swelling, dry eyes, bruising, and discomfort. We will prescribe pain medication to all of our blepharoplasty patients, and we strongly recommend using cold compresses, lubricating eyedrops, and ointment on the eyelids for one week. These side effects are completely normal and will typically fade away in one to three weeks. Additionally, to aid in the healing process, we recommend avoiding contact lenses for two weeks after surgery so that your incisions can heal correctly. Regarding activities, you should be able to return to reading within 2-3 days, and we recommend waiting 3-5 days to return to non-physical work. Rigorous activities may be resumed in as little as 2 weeks, once your initial recovery is complete. Regarding results, we typically see our blepharoplasty patients with results that last 7-10 years, and, in some cases, permanently. 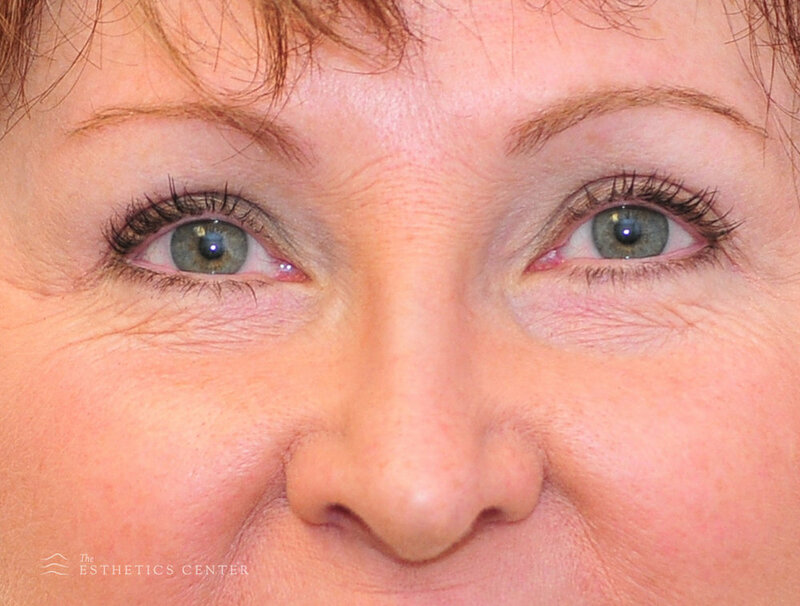 If you would like to see real Esthetics Center of El Dorado Hills patients who have had blepharoplasty surgeries done, scroll down to the bottom of this page. The results will astound you— there simply is nothing like this surgery when it comes to curing the look of aged eyelids.